Courret said the biggest issue for the group, which meets weekly at different locations and has been around since 2007, is a different kind of even more dangerous species. “Being visible to junks, speed boats and jet skis is our main concern,” he said. The group, which has almost 2,000 members, rotates weekly swim sessions on Saturdays between various places including Repulse Bay, Deep Water Bay, Chung Hom Kok and Stanley. Courret said each swim was between 2.5 and four kilometres and requires participants to wear a bright cap and swim with a safety buoy. Courret, who also competes regularly in triathlons, said it added another element to swimming that a pool cannot. He said learning to swim in waves, currents and in groups was also a key part of learning how to become an open water swimmer. “You have to go to the pool like you have to go to the track to improve your technique and speed but open water is freedom. There is a special connection to nature. 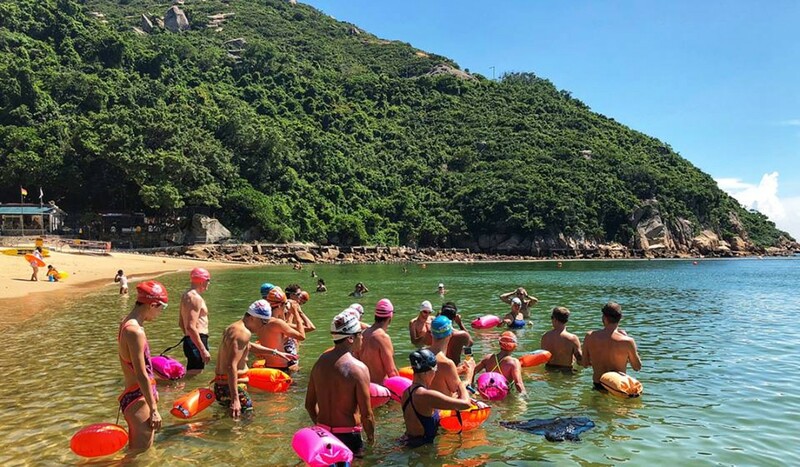 The group, which does not require membership, started out of Repulse Bay and now has a programme which helps swimmers transition from the pool to open water. The group also recently completed a swim/run session, in which participants transition from the water to trails. Swim/run events are gaining popularity in the United States, most notably one in North Carolina which requires swimming, climbing and running. Hong Kong’s New World Harbour Race in November drew 3,358 swimmers who made the trek from the Tsim Sha Tsui Public Pier south to the Wan Chai Golden Bauhinia Square Public Pier. The next scheduled swim will be in Deep Water Bay on December 8. The route will start at the Victoria Recreation Club and head out around one or two buoys, in either 500- or 750-metre repeats. Courret said no swim goes over 90 minutes to accommodate various fitness levels. Courret said there was a lot to learn when it comes to open water swimming, including navigation, drafting, sighting, rough water swimming and swimming as part of a group. He said the biggest issue for new open water swimmers is staying calm. The world’s longest open water swim was completed by Croatian Veljko Rogosic, who swam 225 kilometres across the Adriatic Sean from Grado to Riccione over the span of three days. His swim, according to Guinness World Records took 50 hours and 10 minutes. Courret said open water swimming is incredibly meditative. Drinking bubble tea: how can you cut back on all the calories?